The Clos LaChance winery is located just a short drive from San Jose at the base of the Morgan Hill and San Martin mountains. While you are seated on the Grand Terrace as a guest of the bride and groom, you will most certainly take in the views of the exclusive CordeValle Golf Course and the acres of vineyards that surround you. 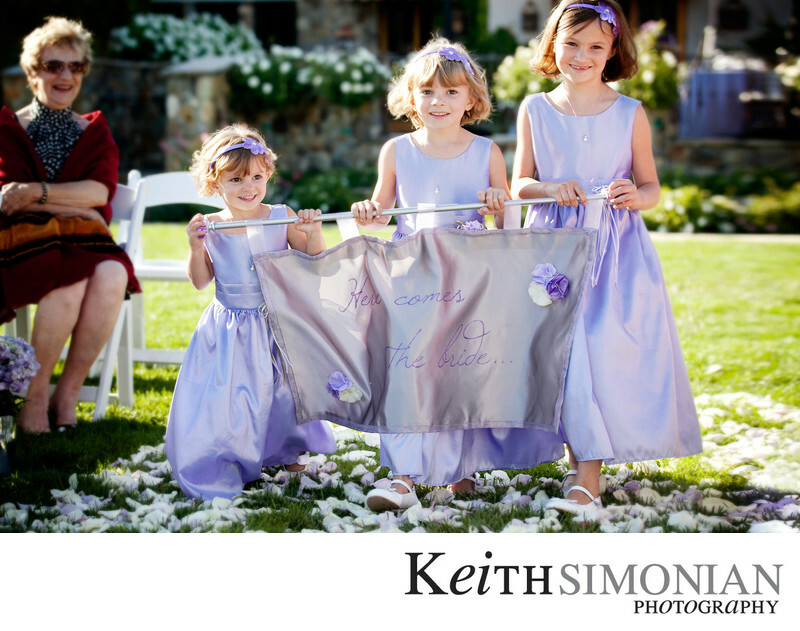 After the Brides maids had walked up the aisle, the three sisters dressed alike carried a sign on the flower covered path at the winery that announced the "Here comes the Bride". Location: Clos LaChance Winery 1 Hummingbird Ln San Martin, CA 95046. 1/1000; f/3.5; ISO 250; 85.0 mm.